Insects are invertebrates in the class Insecta , which contains 28 living orders. The animals that make up this class have a number of distinctive features. 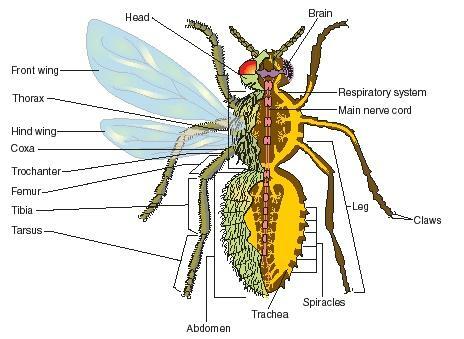 Their adult bodies are typically divided into three parts, known as the head, thorax, and abdomen. In addition, they have three pairs of segmented legs attached to the thorax and one pair of antennae. Members of the subclass Pterygota have two pairs of wings as adults. By contrast, some relatively primitive members of the subclass Apterygota are wingless. Taxonomists (scientists who classify organisms) have recognized more than one million species of insects, more than any other group of organisms. In addition, scientists believe that tens of millions of species of insects remain undiscovered. Currently, scientists estimate that as many as 30 million species of insects inhabit Earth; most of these are thought to be beetles. In fact, all of the insect orders are poorly known. Most of the undiscovered species of insects occur in tropical rain forests, especially in the upper parts of the forest known as the canopy. Globally, the insects exploit a remarkable diversity of habitats. They are ecologically important as herbivores (plant-eaters), predators (meateaters who hunt their prey), parasites (who feed on living organisms), and scavengers (who feed on dead organisms). As a result of these attributes, insects are considered to be one of the most successful group of organisms on Earth, if not the most successful. To a biologist, the term bug has a very special meaning. It does not refer to just any insect, as it may when nonscientists use the term. True bugs are members of the order Hemiptera. The order consists of about 35,000 widely different species. Examples of terrestrial (land-living) bugs living in North America are lice, aphids, bedbugs, stink bugs, plant and leaf bugs, assassin bugs, ambush bugs, seed bugs, lace bugs, and squash bugs. Examples of aquatic bugs are water boatmen, backswimmers, giant water bugs, water scorpions, and water striders. Bugs have two sets of wings although in some species, the wings are greatly reduced in size and the animals cannot fly. The mouthparts of bugs are adapted for piercing and sucking. Most bugs use these mouthparts to feed on plant juices. A few are parasites of vertebrates, living on the animal's surface and feeding on its blood. Most bugs have long, segmented antennae. They tend to have well-developed compound eyes, although some species have several simple eyes as well. Many species of bugs have glands that give off a strongly scented, distasteful odor when the insect is disturbed. The common name of one species, the stink bug, is evidence for this fact. Some species of true bugs are brightly and boldly colored. In most cases, these bugs feed on plants that contain poisonous chemicals that also occur in the bugs. These chemicals cause the insects to taste bad, providing protection for them from predators. The bright coloring provides a warning to predators that their prey not only look beautiful, but also taste bad. While many bugs attack agricultural crops and cause economic harm to humans, a few are health hazards also. Bed bugs, for example, feed by sucking the blood of birds or mammals, including humans. Although their bites are irritating, they do not carry disease. By contrast, the Central and South American bugs sometimes known as kissing bugs are known to transmit the parasitic protozoan that causes Chagas' disease. Chagas' disease is characterized by recurring fever and may cause serious damage to the heart muscles. Insects have a complex life cycle that consists of a series of intricate transformations called metamorphoses. At each stage of its life cycle, an insect is likely to have very different body shapes, functions, and behaviors. The most complicated life cycles have four stages: egg, larva, pupa, and adult. Examples of insect orders with this life cycle include butterflies, moths, and true flies. Other orders of insects have a less complex development with only three stages: egg, nymph, and adult. Insect orders with this life cycle include the relatively primitive springtails and true bugs. Most insects are nonsocial. However, some species have developed remarkably complex social behaviors, with large groups of closely related individuals living together and caring for the eggs and young of the group. In such groups, the young are usually the offspring of a single female, known as the queen. This social system is most common in bees, wasps, ants, and termites. A few species of insects are useful to humans. For example, we obtain honey from bees and silk from silk worms. Some insects, however, are detrimental because they transmit human diseases. For example, malaria, yellow fever, sleeping sickness, and certain types of encephalitis are caused by microorganisms. These microorganisms are transmitted by certain species of biting flies, especially mosquitoes. When one of these insects bites a human, it may ingest a disease-causing microorganism in the blood it drinks. When the insect bites a second person, it may then transfer that microorganism—along with the disease it causes—to its second victim. Other insects eat the leaves off trees and thereby cause substantial damage to commercial timber stands and to shade trees. Insects may also defoliate (remove the leaves from) agricultural plants, or they may feed on unharvested or stored grains, thus causing great economic losses. Some insects, particularly termites, cause enormous damage to wood, literally eating buildings constructed of that material. Pesticides—chemicals that are toxic to insects—are sometimes used to control the populations of insects that are regarded as major pests. This article is so useful for student it is so good . try shear more information thanks.